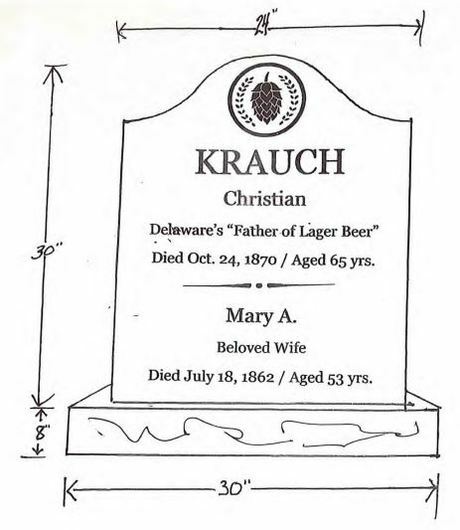 Christian Krauch, Delaware's "Father of Lager Beer" and one of the most significant figures in the state's brewing history, was buried in an unmarked grave at Wilmington & Brandywine Cemetery in 1870. Help us honor Krauch and his contributions to Delaware's brewing heritage with a donation to his memorial fund. Here is a rendering of proposed Krauch memorial, courtesy of Pauley Memorials (Wilmington, DE). David Ashby18 weeks ago Here's to one of the most influential beer Brewers! Swampy24 weeks ago This fine gentleman and contributor to Delaware's history deserves a better recognition of his achievements. David & Cheryl Roach24 weeks ago Best wishes.